About: Experts in haircolouring! This salon uses Aveda colours which are 97% naturally derived and is one of the top brands in the business. West end quality, friendly and welcoming staff at affordable prices. There is also a car park next to the salon so its very convenient and it only costs 35pence an hour to park! Give it a try, you wont regret it! I do not normally review anything but I do like reading reviews and after my appointment at a cut of breeze I am so happy that I feel I have to leave this comment. I have recently moved to streatham from Manchester so had to find a new salon. 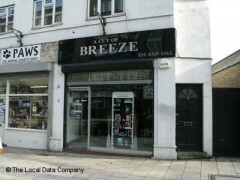 I decided to choose a cut of breeze as I walk past on my way to streatham hill station regularly and it looks nice. I had a colour change with Danielle and a hair cut with Brie both lovely girls and I'm really happy with what they have done, will be recommending to everyone, thank you so much. HIGHLY RECOMMENDED - Brie at Cut of Breeze is truly amazing – I started going to her 10 years ago now and was immediately impressed with how personable, knowledgeable and above all professional she is. I relocated away briefly and was always disappointed with other stylists, and faced a hard time because my hair is very thick and long, so needless to say I was very relieved to move back home to be able to go to Brie again. With super friendly service, Brie has that rare ability to listen to what you want, make objective suggestions and treat you with care and attention – her prices are good too, so you get real value for money. Over the years I've used other salons in the area, including those on the high road, and have absolutely no hesitation in recommending Cut of Breeze as by far the best of the bunch and a refreshing change.